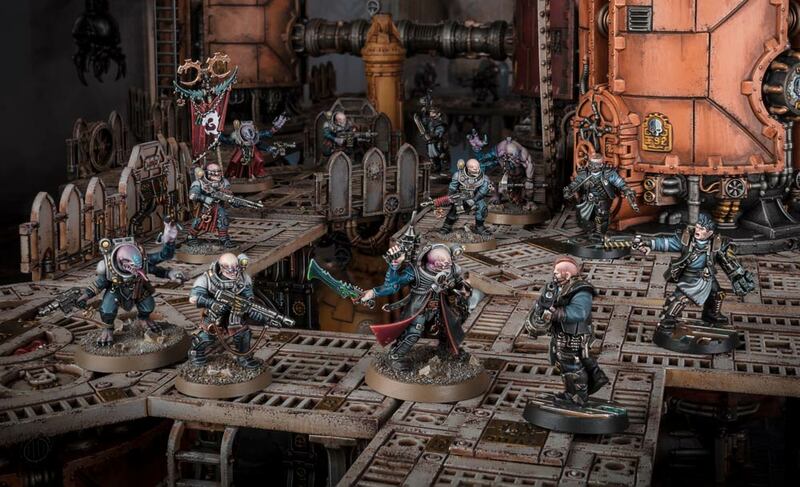 Following on from Monday’s blog where I took stock of where I was at with my Genestealer Cult force to date, I’ve been giving some thought to where I want to take the miniatures that I have available to me right now, and see if I can try to build a list using those. It’s been an interesting exercise, while I’ve been trying to compile the points values using the upcoming Chapter Approved leaks for 2018 to make it as accurate as I can for the time being, but I’ve come up with something that will hopefully give me some interesting stuff to do on the tabletop. It’s exactly the sort of thing that I like to go for – troops-heavy, with a few interesting bits on the side to add some interest. These “interesting bits” currently comprise the Acolyte Hybrids, which I would be intending to deploy through Cult Ambush in order to get them better where I want them. 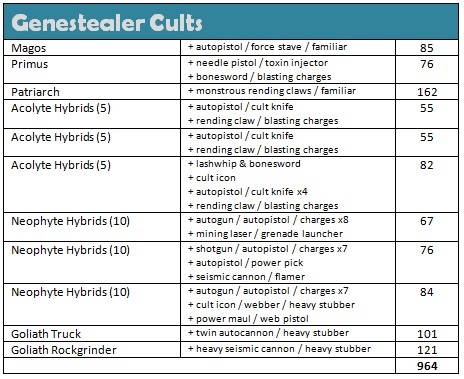 But the list is flexible enough that I would be looking to swap some of this stuff out as I get more familiar with it, possibly for just a few more mining weapons in the squad, or possibly swapped altogether in favour of something like Hybrid Metamorphs or Purestrains – indeed, it feels a little bit weird to be writing a GSC list with no actual genestealers in there! 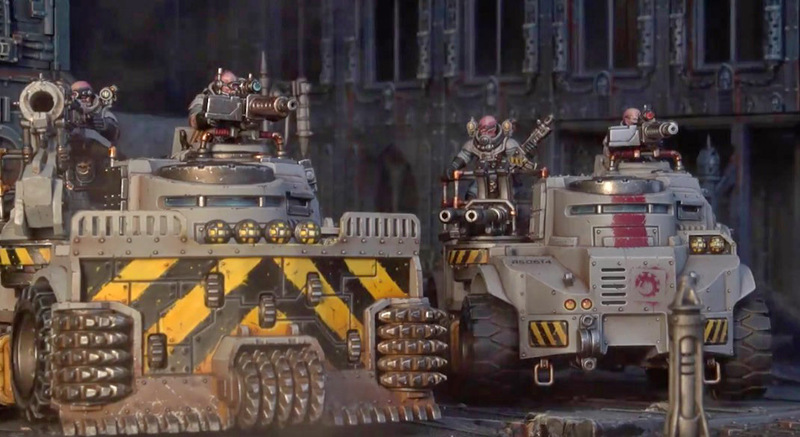 The Goliath kit is one that I really like, as it creates a vehicle that we otherwise just don’t see the like of in 40k. I built my first one as a Truck, which is just lovely, but I have another waiting in the wings, and I’m going to build that as a Rockgrinder, because all of that drilldozer blade goodness is just too hilarious not to use in an army! I have no idea if such a thing would be any good, of course, but it would definitely look good! Talking of beautiful additions, of course, we also have a load of good stuff on its way when the Codex arrives! While it might be a bit foolish to hope for even more new models to come when the book comes out, I think adding in a biker force will be a major priority for me, and I would think the Acolytes would be the first things to go. I do like the idea of having this element in my army, so I’m definitely looking forward to picking up some bikes when they’re released! I have got some points spare, of course, and I’m hoping that I’d be able to slip this gent in there once he comes out as well. It’s a really iconic look for the army, and definitely the sort of miniature that I can see people rushing to get just for the fact that he’s looking to take over Warhammer World! Of course, if I can get him in the list as it stands, that would mean I have two battalions there, which would be nice! But I’m really trying to not build my lists around the incessant need to keep generating tons of command points. I’d rather play with something that I actually want to use, than include things because I need that second HQ for a battalion, or whatever. I still have a long way to go before this list is painted, sadly. There are fifty-two models in the list, including the two familiars, and I have less than 20 painted up right now. They’re all so fabulously detailed that I feel I need to make a real attempt to show off that detail, but my goodness, does it make it hard going! In the meantime, I’m trying to get through it all by thinking along the lines of just painting up a small force for Necromunda, or Kill Team – painting for the latter is how I managed to get those Neophytes finished that had been hanging about in various stages of completion up to this summer. Hopefully thinking of a lower model count will help me to get through it all this time, anyway! There’s nothing quite like seeing a collection of Neophyte Hybrids painted up nicely, though, so it’ll all be worthwhile in the end! I want those guys on the bikes so bad, they look awesome!